Every year around this time I try to make some fruit vinegar which will be used as gifts for friends and family. You have to be quick to get some little decorative bottles because probably a hundred thousand other people have the same idea. I usually make a couple of batches, so we have some for the year ahead as well. This recipe comes from one of my most favourite cook books, “A Pickle and Chutney Cookbook” by Digby Law. It was published in 1986, and has been well used over the years. Sadly Digby Law isn’t with us anymore, which I have always thought very sad, he died too young and I’m sure could have continued to provide us with great cookbooks for many more years. On the stove, just getting ready to boil before simmering. Place the raspberries in a bowl and add the vinegar. Cover and let stand for one week, stirring every day. 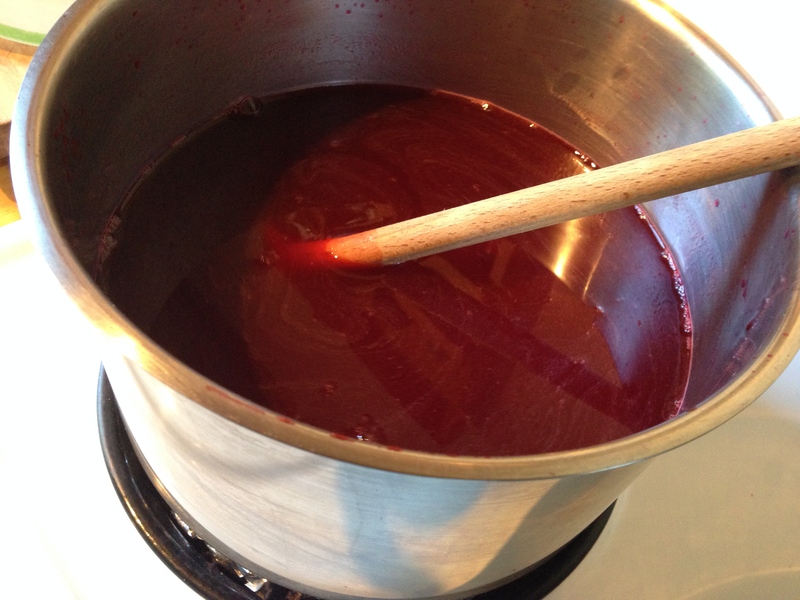 Strain the liquid, without pressure into a saucepan and add the sugar. Bring to the boil and simmer for 10 minutes. Allow to cool, then pour into clean bottles and seal. I love the colour of this vinegar. It is a rich red and just looks so delicious. You can use frozen fruit instead of fresh. I just put it into the bowl and add the vinegar, don’t worry about defrosting. When you strain the vinegar from the bowl into the pot, don’t be tempted to squish the fruit to get more juice. It will make your vinegar too cloudy. Believe me….. Also, when bottling, I always strain through a piece of muslin over a funnel. It’s a bit fiddly, as you have to rinse the muslin quite often during the process, but I think the end result is definitely better, a much clearer vinegar. If you hate sterilising bottles, keep your used gin/vodka bottles (don’t rinse them), and then pour the vinegar directly into the gin/vodka bottle. Probably frowned upon by the sterilising police, but works for me.